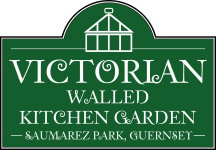 Guernsey Botanical Trust’s team at Victorian Walled Kitchen Garden have celebrated Guernsey’s legendary tomato industry by introducing the heritage tomato ‘Nisbett’s Victoria’ (NV) to their garden and interested public. April 7th, saw the launch of Guernsey Botanical Trust’s Heritage Tomato Festival, sponsored by Waitrose and held at National Trust of Guernsey’s museum in Saumarez Park. ‘NV’ has presented us with some head-scratching dilemmas from its name, to its quirky growth behaviour. Nisbett’s Victoria is also referred to as Nesbitt’s or Nisbitt’s Victoria so NV’ is our next safe bet! At the time of writing, most seeds have germinated and young plants are well established. Looking at our very well established plants here at the garden, we have discovered a problem. The plant is too fruity for its own good! Radical pruning is required to enable the plant to fruit in a reasonable period of time. NV seeds and advice have been distributed to island schools, the public and Volunteer Gardeners at VWKG. We’ve also established a Guernsey Tom Facebook page which gives horticultural advice on NV and monitors progress from others. On Wednesday 22nd July, we visited David Lanoe who was the first to notify us of ripe and ready to eat Nisbett’s Victoria tomatoes. Many congratulations to David, who as winner of the NV competition, receives a £25 gift voucher to spend at Le Friquet. For more detail and photographs of David’s success story, please visit the Nisbett’s Victoria page.